This festive dish is a variation on the traditional Beef Wellington, perfect for that special occasion. 1. Remove the pork tenderloin from the refrigerator and allow to come to room temperature while you prepare the Mushroom Filling. 2. To make the Mushroom Filling, in a large skillet over medium heat, melt 1 Tbsp. of butter. Cook the mushrooms and shallot until tender, stirring occasionally. Season the mushroom mixture with salt, pepper, and thyme. 3. Stir in the flour until fully incorporated, then stir in the sour cream. 4. Remove the mushroom filling to a small bowl and set aside. 5. For the Pork, season the meat with the salt and pepper, rubbing the seasoning well into the meat. 6. In a large heavy skillet over medium high heat, melt the oil and butter together until very hot. 7. Tuck the tapered end under the tenderloin before placing in the pan. Sear the meat until nicely golden brown on all sides. 8. Remove the meat to a plate and cool completely. 9. For Assembly, in a small bowl, whisk together the egg and water to form an egg wash.
11. 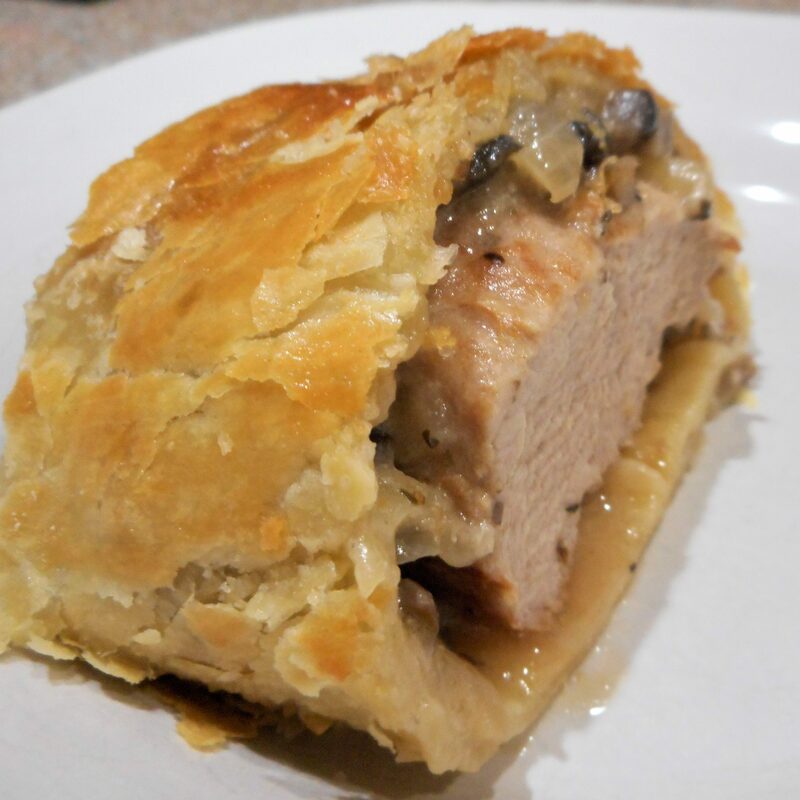 Place the mushroom filling in the center third of the pastry for the length of the pork, leaving the ends clean. 12. 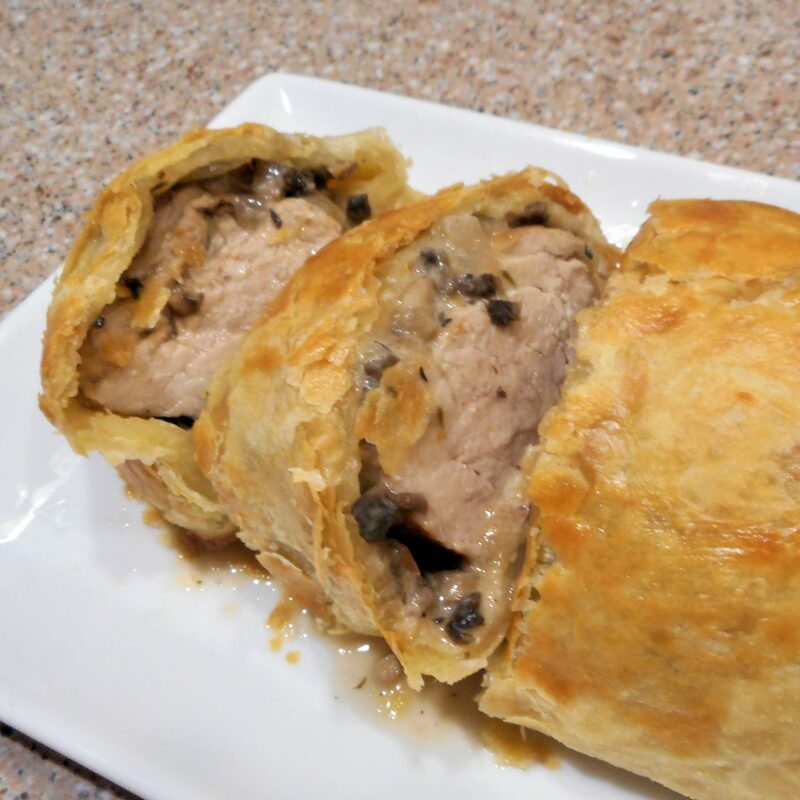 Center the pork over the mushroom filling, then pull the long sides of the pastry up over the meat and pinch to close. Seal both ends of the pastry up over the roll, again pinching to close. 13. Turn the pastry package seam side down and brush with the egg wash. Freeze 15 minutes or until the pastry is cold to the touch. 14. While the Wellington is in the freezer, place a foil lined baking sheet in the oven and preheat to 425°. 15. Place the pastry package on the baking sheet in the hot oven, then reduce the heat to 400° and bake for 25 minutes, or until golden brown. 15. Remove from the oven and let rest for exactly 10 minutes before cutting to serve.